The Company of the Brussels Volunteers of 1830 was founded in 1986 by Mr Adrien Lenaerts as a patriotic and folklore association. 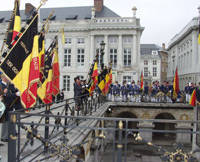 Its purpose is to honor the volunteers who fought for the independence of Belgium in 1830. In the Crypt on the Place des Martyrs in Brussels. Clearly the (Protestant) Dutch regime was not liked at all in our Catholic regions in 1830. When the fighting started in September 1830 volunteers came to Brussels from all over Belgium and from abroad to help chase the Dutch away. And thanks to their heroic efforts Belgium won its independence. The square now called Place des Martyrs was a vegetable garden until the interments began in the evening of 27 September 1830 at the end of this last day of fighting in Brussels. The remains of 466 men killed in the fighting against the Dutch rest here. One of the ancestors of Mr Adrien Lenaerts is among them. Another is Mr Bernard Roels from Maldegem. Why on earth would he be the only one from our Meetjesland to have been implicated (with fatal result for him) in this conflict ? We heard from someone whose wish for anonymity we respect. He ventured to suggest that, perhaps after a dozen centuries of propinquity to the Dutch or rather propinquity to the Zealand Flanders Dutch from south of the great Scheldt river, who perhaps by intermarriage with the Flemish might have mellowed a little, the peace loving people of our Meetjesland have found a way to live with this providing certain conditions are met. Already in 1831 a monument was built here to honor these men. The whole site of the crypt and the Pro Patria monument was inaugurated on 24 September 1838. 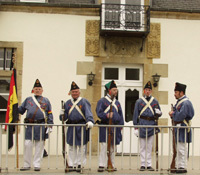 The Brussels Volunteers of 1830 take care of its upkeep. 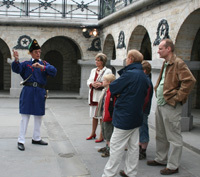 Since 2006 the Brussels Volunteers of 1830 are in a not-for-profit association side by side with the Royal Society of the Descendants of the 1830 Combattants and the Crypt of the Martyrs whose purposes have always been very similar. There are 467 different names on the marble stones in the crypt. One man's name is listed on two different stones. Frederic de Merode is also mentioned but in fact he died in Mechelen and is buried in the Cathedral of St. Michael and St. Gudula in Brussels. Every year the Company takes part in several marches. The most important of these marches organized by the Brussels Volunteers of 1830 themselves takes place every year on the 4th Sunday of September. War veterans, patriotic associations, other groups of Volunteers of 1830 and civil authorities come together with the Brussels Volunteers of 1830 up to full strenght around the Crypt and monument in the center of the Place des Martyrs to commemorate those who fought for Belgium's independence in September 1830. From there the march usually goes via the Grand-Place to end in a more joyous fashion and on a more folkloristic note in the rue de l'Etuve... in front of Manneken Pis. The 2006 September Remembrance Ceremony started at the Congress Column which is also the tomb of the Unknown Soldier. Here we have a few dozen pictures of this memorable day. The President and Commanding Officer of the Brussels Volunteers of 1830 is Mr. Charles Philippon. The honorary president is Adrian Lenaerts, the founder of the Company. He is also a member of the Corporation of the Knights of St. Michael of Brussels. Mr Emile Fivé was the previous Honorary President. He was the last surviving great-grandchild of an 1830 combattant. Mr. Fivé was also a WW II veteran. He was in the thick of it i.a. in Bentille. The Vice-president is Mrs. Simonne Byl. The Treasurer is Mr. Jan Dorpmans. The standard-bearer of the Company is Mr Albert De Vriese. The headquarters of the Company is the Saint-Catherine's Tower in Place St. Catherine in the center of Brussels. And here is the official website of the Company. The Brussels Volunteers of 1830 are not the only Company of Volunteers of 1830 in Belgium. Far from it. We list below a few of the other 1830 Companies. Founded by Mr. Jean Fivet and their President Mr. Paul Marchal. You can find out more about them here. The current not-for-profit association was set in 1950. Here is their website in French. This company was founded in 1980. Their President is Mr. Gaston Alexander. Much appreciated also for their drummers and fifer. The Workgroup 1830 is a Flemish group of Volunteers of 1830. Their President is Mr. Jan Schuurkes. This Company has a lot of members and dates from way before 1830. We mention them here because of their invaluable contribution to the Belgian cause in 1830. 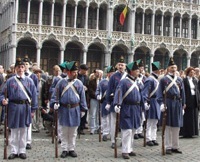 They were more than 50 strong to march through Brussels on 24 September 2005. They had been on a similar march in Brussels in 1905. They have a museum in Visé. And they also have a big and beautiful website (in French) which you can visit here.